A number of patients have come in to the office recently with vertigo. Vertigo is usually a minor annoyance but rarely it can be a sign of a very serious problem. Vertigo is actually a symptom, not a medical illness in and of itself. It is defined as the illusion of movement. This means you feel like you’re moving but you’re actually not. Everyone has had vertigo. Do you remember when you were a kid and spun around in a circle over and over to make yourself dizzy, then fell down on your back to watch the sky whirl around? That was vertigo. 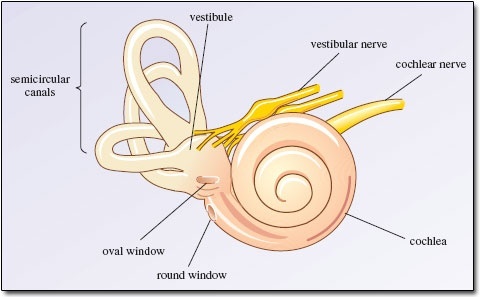 Vertigo is a problem with the inner ear. There are delicate fluid-filled tubes in the inner ear called semicircular canals that sense the movement of the head. When the fluid can’t shift the way it should, or the ear can’t sense the movement properly, the brain gets mixed signals. Have you ever been seasick or carsick or airsick? Motion sickness is a problem when the brain gets signals from the eyes and ears that don’t match. If the ears say you’re moving and the eyes say you’re not (like turbulence in an airplane or trying to read in the car) the brain can’t make the signals match. Nausea and dizziness are what happens. You can get vertigo as part of a viral respiratory infection if the virus infects the inner ear. Swelling will keep the fluid from moving properly and may keep the inner ear from sensing movement properly. This is called labyrinthitis. You can also get symptoms if a little bit of debris blocks fluid from moving properly in the canals. This is called benign positional vertigo and happens with movement and stops when you’re not moving. There are a few times when this can signal a serious problem. Vertigo in combination with hearing loss can be a sign of an illness called Meniere’s disease which happens when there’s too much fluid in the inner ear. The unusual combination of vertigo and hearing loss in just one ear can be a sign of a benign tumor on the acoustic nerve. Very rarely, vertigo can be a sign of a stroke if it affects the part of the brain related to balance. This is of course more likely in those who are at risk for strokes. What can we do to help vertigo? Well most cases of vertigo are just annoying, not scary or dangerous. So most of the time we focus on keeping the patient reasonably comfortable while the body heals the problem on its own. Antihistamines like diphenhydramine and cetirizine are helpful, as are over-the-counter motion sickness medicines like Bonine and Dramamine. If simple measures don’t work, sometimes steroids are useful to decrease swelling and inflammation in the inner ear. Other treatments are used based on the cause. If you develop dizziness and a feeling like you’re moving or spinning or off-balance, please see the doctor if the symptoms don’t subside right away if you sit perfectly still. Most of the time it’s just an aggravating, temporary problem that feels better with some simple treatments. However if it keeps up or you’re very uncomfortable or there are signs of a serious cause, more tests may be needed. QUESTION: Have you ever had vertigo? How was it treated? Long days. Unpleasant coworkers. Low pay. Child care hassles. Work stress is really hard on us working parents and others as well. However, you might want to pay a little more attention to your level of work stress, especially if you’ve got a family history of diabetes, heart attacks and strokes. Excessive work stress may actually put your health at risk! Last month a research study was published showing a link between high work stress and risk for diabetes. Other studies have shown that excessive work stress increases the risk of heart attacks and strokes as well. The study published last month showed that people with increased work stress were over 50% more likely to develop diabetes over a 12-year follow up period than those who had less work stress. This is huge! Diabetes is an enormous risk factor for heart disease, our country’s number-one killer. Other studies have showed similar findings. It would be tempting to assume that the increased diabetes risk is due to unhealthy lifestyle habits. You know, you’re working long hours so you’re not exercising and you’re eating too much fast food. Not true. There was a study published in 2014 that looked at this idea. Looking at almost 125,000 people, they were able to show an increased risk of diabetes even after controlling for unhealthy lifestyle habits. So what might causing this increased risk? There are a lot of possibilities. Stress raises cortisol levels in the body which over time can change the way the body metabolizes sugars. Cortisol metabolism also strongly correlates with fatty liver disease, which is associated with diabetes. The mechanism really isn’t well understood. There may be numerous mechanisms. What is clear, though is that excessive work stress raises the risk for a number of serious health problems. What should we do with this information? First of all, DO NOT assume that just because you eat healthy and exercise regularly you are protected from the health effects of stress. The research is very clear that stress is one of many determinants of health and they are ALL important! DO eat healthy. DO exercise. But also please make sure you are managing your stress in healthy ways. Get plenty of sleep. Practice your faith and practice gratitude. Make time to play and have fun with the people you love. Have perspective on the influence of your career on your life. Don’t let your work become the end-all and be-all of your life. Your work is how you earn money to support yourself and your family. Your work is one way you strive to leave your mark on the world. Don’t let it consume you and become the way you define yourself. QUESTION: Does this research about work stress and health risk surprise you? Will you change anything about your work habits based on this information? When I was seventeen, one day I found a lump on the left side of my neck. It was in a funny place, lower down on my neck than it would be if I had a cold. It didn’t hurt, so I shrugged and thought I’d show it to my mom or dad that evening. Turned out a few hours later I had a fever and a horrible sore throat, like someone had used razor blades in there. It hurt even to sip water. Eating was out of the question. My lump developed a bunch of friends all around my neck. My mom called the doctor and the next day took me in. The doctor took one look at me falling asleep in the exam room, checked my throat, admired my collection of swollen glands and the lovely jaundiced yellow of my skin, and informed my parents that I had infectious mononucleosis. I don’t remember much of the next few weeks. I had hepatitis, tonsillitis and hugely swollen glands in my neck, my armpits and other places too. (Who knew there even WERE glands in some of these places!). I slept nonstop unless my mom woke me up and made me eat macaroni and cheese or pudding and drink some water. Infectious mononucleosis is a contagious illness usually caused by the Epstein-Barr virus (EBV). This virus is a member of the herpes virus family, like chickenpox and the cold sore virus. The illness can be very mild, sometimes with no symptoms at all, or it can be serious enough that a person has to be hospitalized. The virus is transmitted from person to person in saliva, through kissing or by sharing eating utensils and beverages. This is one reason why teenagers are the ones who usually come down with infectious mononucleosis. Dating! Studies have shown that more than 50% of people have antibodies to EBV when they graduate high school. Typical symptoms of infectious mononucleosis include fever, swollen glands, severe fatigue, and swollen, painful tonsils. Almost all patients have hepatitis (inflammation of the liver). Some patients, like me, actually get jaundiced. Lab testing shows a high percentage of atypical lymphocytes and monocytes in the blood, which gives the illness its name. Steroids like prednisone are used to relieve the symptoms. One concerning problem in teens with mono is that the spleen can get swollen. If a patient has trauma to the abdomen (like getting tackled in football or kicked in martial arts) the spleen can rupture and the patient can bleed to death. If a teen plays contact sports they should be screened with an ultrasound of the spleen before returning to play after a bout of infectious mononucleosis. When I had mono as a high school senior, I missed several weeks of school and work and it took me a long while to get back to normal. Luckily it didn’t have any long-term impact on my academics and my part-time job at a fast-food restaurant was happy to wait until I was ready to come back. For most patients infectious mononucleosis is an inconvenience, an annoyance that causes some significant short-term misery but no long-lasting consequences. The illness can cause life-threatening complications but thankfully this is rare. QUESTION: Have you had mono? What was your experience like?